We use electric toothbrushes at our house, but I like to use a regular toothbrush in the morning. 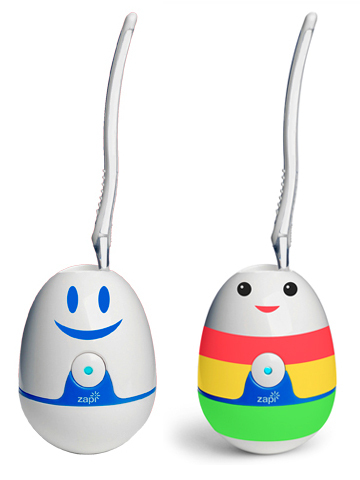 I have had my eye on one of these Zapi toothbrush sanitizers. 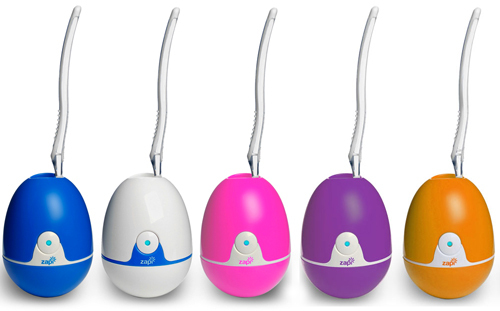 The Zapi has an ultraviolet light to kill 99.9% of germs on your toothbrush. Stuff growing on my toothbrush is on of those things I don't like to think about. You can even get them with smiley faces. Or for kids... Hiyah Zapi or one you can put stickers on. So I noticed today that the Zapis are $9.99 on kids woot I wanted to let you know so I'm also sending you a message via twitter. Awesome! Thank you so much for letting me know! I just ordered Zapi Ya Ya. It's a unique product you can use for optimal dental care. Other dental care products should also be provided with coupons and discounts. Sanitizing toothbrushes help maintain good oral health. Maintaining dental health can be done through this product. This isn't an OC-exclusive tool. People should take into consideration the state of their toothbrush. Those are really cute! I think I'll get one for my kid. He will love another addition to his toothbrush collection. I was looking for some new toothbrushes for my kids and this definitely fits the bill. Where can I buy them? I didn't know that there's such a product. I will try it so I can be sure of the cleanliness of my toothbrush. The tool can be used to sanitize your toothbrush. This is a useful equipment. These are so cute! I bet kids will go crazy for these toothbrush cleaners. But, remember to still change your brushes after 3 months. This is one of the best ways to make your tooth brushes clean and germ-free. I would love to have this kind of tooth brush sanitizer. Pink strikes my eyes, the designs are cute and very stylish. I guess I just found the perfect gift for my daughter. These toothbrush sanitizers look cute. I like the fact that you would no longer need to worry about the cleanliness of your toothbrush because of these products. This is the toothbrush sanitizer that my orthodontist Concord NC is telling me. It's a brilliant products because it kills the germs that we don't see while cleaning our toothbrushes. I'm a fan of this toothbrush sanitizer because it's so cute. My dentists in Bartlett recommended this to me and it's so effective. My son loves to brush his teeth always whenever he sees this at home. These are so cute because they look like toys and bathroom decorations. My dentist Rock Hill says this is a must for every household so I better to get these colorful toothbrush sanitizer for my family. That's one of the coolest toothbrush holder I've seen. Thanks for sharing this one. Customizing one would make me feel better and brush some more. Products like this is useful. It helps maintain the cleanliness of the toothbrush. These are really awesome and cute toothbrushes. Kids would definitely cleaning their teeth. It would be easier for parents like me to encourage them to brush their teeth. I bet my kids will love these things! They are amazing and cute at the same time. Now I need to know where to purchase these? Wow! That's something new! I thought it was just another ron receveur scams which has always turned out to be something great on my mailbox but that will surely be enjoyed by my kids. I'm glad to have come across this site to vindicate my suspicions. Those pretty brush case is really is cute. My marietta ga dentist will surely be delighted with this things. hey, I really like this toothbrush sanitizer. It is more beneficial after cosmetic dentistry treatment. Cosmetic dentistry Sydney may provide you the best option for these type of treatments. This is really very cute toothbrush.. Such a very cute tooth brush. Thanks for sharing here.